The Culturally Relevant Urban Wellness Program (CRUW) was developed in 2011 by a community partnership led by Vancouver Aboriginal Child and Family Services Society (VACFSS) interested in promoting the use of green space as a source of wellness and concrete skill development for vulnerable youth. The program is grounded in the concept of food as medicine, and the Indigenous perspective that we derive wellness and community from relationship and interaction with land and territory. Youth Leadership, with an emphasis on promoting self-esteem, positive identity formation, and skills and capacities to support the transition into independent living. 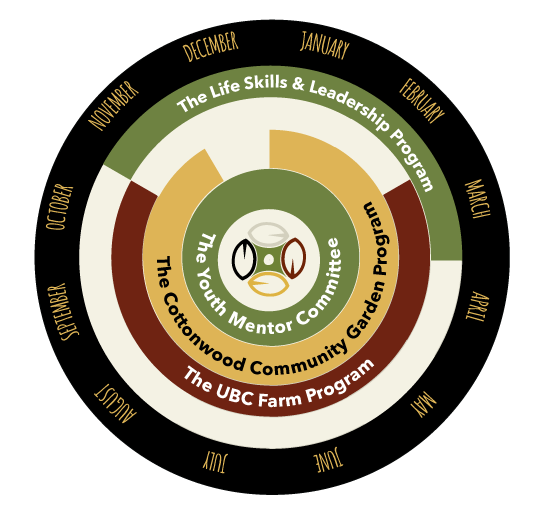 Participants in the UBC Farm Program attend 16 sessions over eight months with Aboriginal Elders and Knowledge-keepers, staff, volunteers and guest instructors. Program sessions are held at the Indigenous Health Garden at the UBC Farm every second Saturday from 9am-4pm. Participants are assigned to one of 3 groups, and remain in that group over the course of the program. Each group rotates through 3 activity blocks each session: 1 in the garden block; 1 workshop led by a guest instructor; and 1 block of goal setting and reflective debrief within their group. Please address any inquiries regarding CRUW to Jeff Schiffer, CRUW Program Supervisor & VACFSS Special Projects Officer, at jeff_schiffer@vacfss.com. For up-to-date information about CRUW and other garden programs, you can download a three-page summary of highlights from our programs in 2014 here. CRUW works on and acknowledges the unceded ancestral territory of the hən̓q̓əmin̓əm̓-speaking xʷməθkʷəy̓əm (Musqueam) peoples, whose guidance and collaboration is so important to this work. CRUW also acknowledges its other supporters and partners: Vancouver Aboriginal Child and Family Services, Pacific Community Resources Society, the Centre for Sustainable Food Systems at the UBC Farm, the Indigenous Research Partnerships, and the Faculty of Land and Food Systems at UBC.